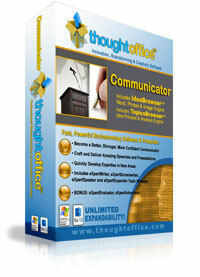 Master Communications with ThoughtOffice Communicator. Write, Speak, and Lead with Confidence. Effective communication skills are the hallmark of great leaders and effective managers. ThoughtOffice Communicator is your key to becoming a better, stronger, and more confident communicator. This powerful software suite will assist you in honing your skills in crafting and delivering impressive speeches and presentations. We’ve assembled key communications modules around the core ThoughtOffice program, to provide you with an unmatched solution for enhancing and improving your communication skills. 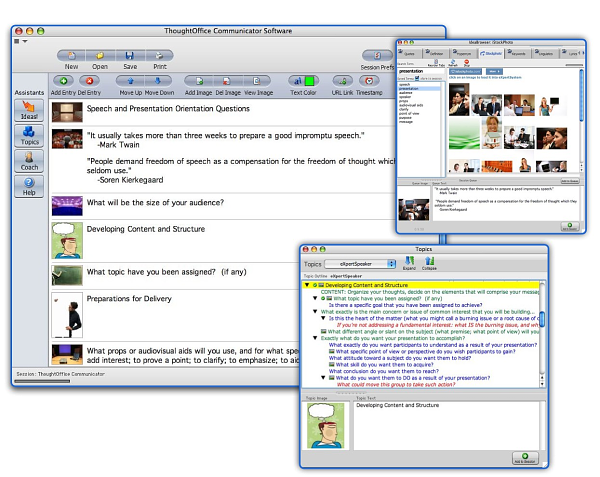 Not only will ThoughtOffice Communicator help you become a better, stronger and more confident communicator, but more often than not, your recognized ability to translate thoughts into words and presentations can directly result in promotions, action on the part of your listeners, and increased sales. ThoughtOffice Software: Including IdeaBrowser; the complete 9,523,680 word and phrase Association Engine, integrated with the Expert Evaluator module targeted for more effective problem solving and brainstorming. Expert Speaker Module: For developing ideas into world-class presentations, and providing the tools to speak them with confidence. Expert Writer Module: Helping you to better understand, establish and enrich your point of view. Then the program assists you in generating the template to keep your writing cohesive and focused. Add metaphors and colloquialisms that come from ThoughtOffice by the barge-load, and you have a phenomenal, unlimited writing machine. Expert Idea Expander Module: Take a sentence, thought or concept, and wring it out with Expert Idea Expander. Twist the context, the dimensions, the palette, the relationship to other elements in your story. With over 2,000 different angles outlined in this module, you can dramatically change the whole character of your writing. Expert Screenwriter Module: Facts tell, stories sell. And having a seasoned screenwriter in the form of software to assist in creating strong stories around you, your product, or your situation is critical. This module assists in every element of story development, making them easier to create, and faster to produce. Used by thousands of screenwriters the world over to craft some of the most creative and infectious stories ever to hit the silver screen. These combined programs would cost nearly $400 at retail. Bundled together, we provide them at a 30% discount so you can begin communicating like a pro immediately!